Kidney deficiency bi syndrome affecting lower back and legs causing slow gait, stiff knees, weak lower back, painful joints and tendons. Chronic lumbago, sciatica, numbness in the limbs, arthritis and rheumatism. General deficiency of kidney causing male sexual dysfunction, female infertility, urinary disturbance are some of the imbalances satisfied clients have used this product for. Morinda officinalis root, Rehmannia glutinosa root-prep, Epimedium brevicornum herb, Dioscorea opposita rhizome, Paeonia lactiflora root, Psoralea corylifolia fruit, Dipsacus asperoides root, Nelumbo nucifera seed, Cornus officinalis fruit, Rosa laevigata fruit, Lycium barbarum fruit, Eucommia ulmoides bark, Angelica sinensis root, Activated carbon, Botanical wax, Talcum. 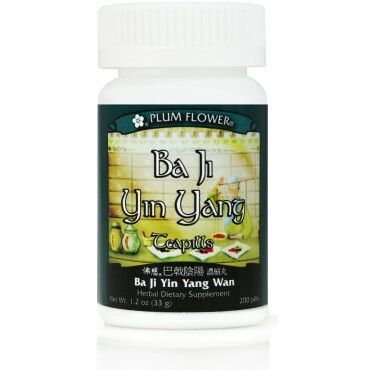 - Ba ji tian, Shu di huang, Yin yang huo, Shan yao, Bai shao, Bu gu zhi, Xu duan, Lian zi, Shan zhu yu, Jin ying zi, Gou qi zi, Du zhong, Dang gui, Activated carbon, Botanical wax, Talcum. Contraindicated during the early stages of acute infection or illness, such as cold or flu. Contraindicated for complaints due to excess.